Updated Thursday August 2, 2018 by Jason Victor. 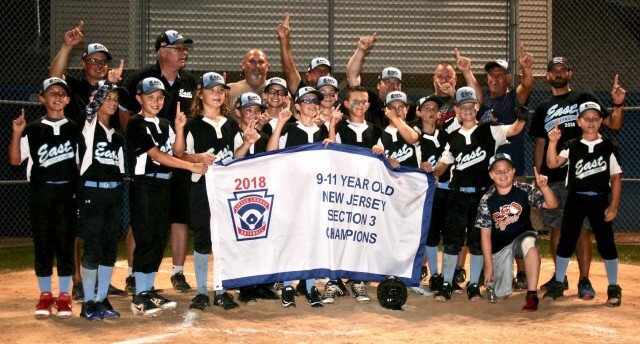 TRELL's 11 Year Old All Stars, the District 18 Champions, continued their run in tournament play this summer by claiming the NJ Section 3 title at Sayreville Little League. The tournament, made up of the district winners from each district in Section 3 was held in Sayreville, and included D10 champs Woodbridge, D11 champs Ocean, D12 champs Bordentown, and D19 champs Middletown, in addition to TRELL. TRELL opened up with an 11-0 win over Ocean and an 5-0 win over Woodbridge. Bordentown overcame TRELL's early lead and defeated our 11s, forcing them to play and win 3 elimination games in 3 days - including needing to beat Bordentown back to back. TRELL roared past Woodbridge 16-2, and in a tough, well played game, defeated Bordentown 4-3 in a 6th inning walk off to force a winner take all game for the championship. TRELL was up for the task, taking an early lead and never letting go on their way to a 4-2 victory and the Section 3 Title. Next up for TRELL is the State Championship in Paramus. TRELL opens play on Saturday, August 4th against Section 4 champs Swedesboro-Woolwich and will play Sunday at a time TBA. Visit njlittleleague.org to keep tabs on how the team is doing, or come up to Paramus and support the team! Thank you to everyone who has come out to cheer on the boys near and far - your support has been tremendous, and has not gone unnoticed! Special thanks go out to Sayreville Little League and their volunteer staff, for hosting a great week of baseball despite the challenges with the weather and for helping create memories that the kids, coaches, and families will always remember!